The second day of our vacation we drove west along I-40 over 250 miles from Oklahoma City to Amarillo, Texas. We broke up the trip with a long stop in Elk City, Oklahoma at their Route 66 and Old Town museum complex. We had a late breakfast at the IHOP near our hotel before driving a bit over an hour along I-40 to Clinton, where we found their Route 66 museum would not open for several more hours. Not wanting to linger, we drove on to Elk City, which has its own museum complex composed of the National Route 66 & Transportation Museum, Old Town Museum, Farm & Ranch Museum, and Blacksmith Museum. We visited all but the final one, which was unappealing on this hot summer day. 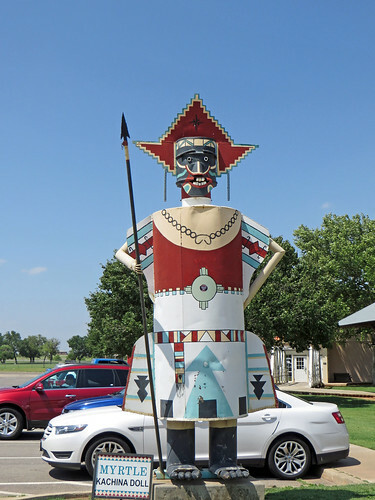 Myrtle, an immense Kachina Doll made of oil drums and scrap metal, greeted us with a toothy smile at the entrance to the Route 66 museum. She graced Queenan’s Trading Post on Route 66 at the west end of Elk City from 1962 until 1990, when she was renovated and put to work at the Route 66 museum. Her friend Ya’at’eeh is nearby, saying “Hello” in Navajo. 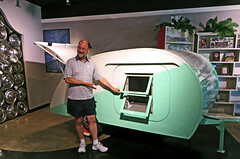 Inside the museum, Wendy bought a Route 66 ball cap and, after I tried to sell Wendy on a 1930s vintage teardrop trailer, we sat in a 1955 pink Cadillac. Two other cars which caught my eye were a black 1953 Lincoln Continental and a white 1962 Studebaker Hawk. The Old Town Museum featured an opera house, chapel, doctor’s office, rock schoolhouse, grist mill, two sections of buildings housing replicas of early day Elk City businesses, a depot with a miniature train and full-scale caboose, and the Bruening House with its sign for Grubitz Furniture & Undertaking. The evidently deadly furnishings in the various buildings were a bit hodge-podge, and we couldn’t walk through the rooms as we did the day before in Prosperity Junction. The heat and bright sun at Elk City, however, were very real compared to the air-conditioned artificial dusk of the recreated old town in Oklahoma City. One can, however, walk through the crowded rooms of the former home of a co-owner of the Herring & Young Mercantile stores which once dotted western Oklahoma. We liked an old panoramic photo of Elk City residents showing off all of their then-new Ford Model A’s back in the day. The memorabilia upstairs in the home from the Beutler Brothers rodeos reminded me of the collections from the 101 Ranch one finds in Ponca City. A large metal building housed the Farm & Ranch Museum, filled with vintage farm equipment. 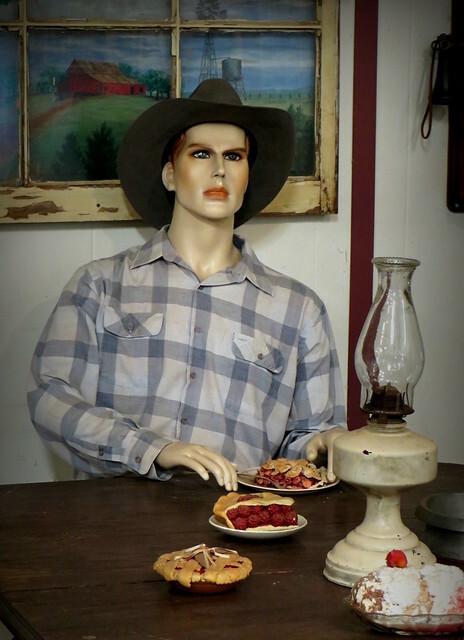 The kindly old docent failed to warn us, however, of the horror show over in the farm kitchen display where a vampiric farmer was dining on berry pie. Egad! 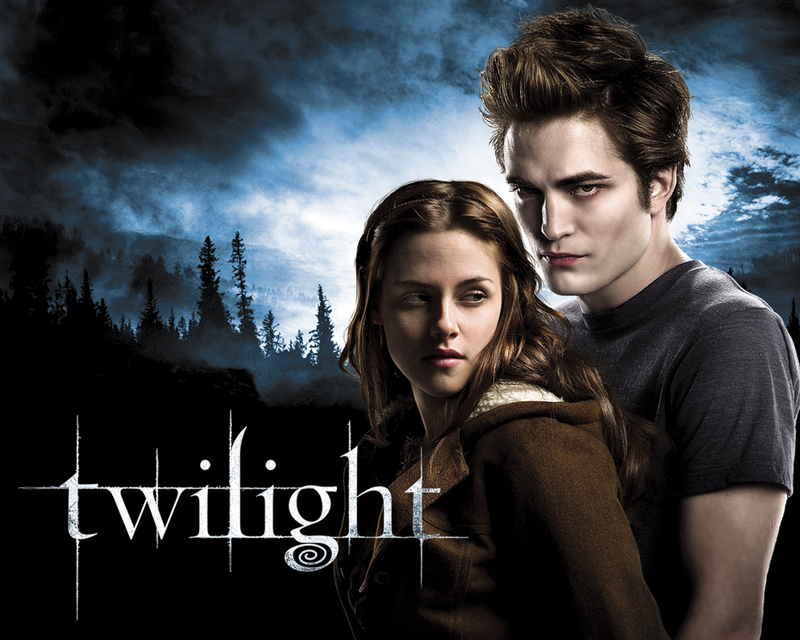 That fellow belongs in a Twilight movie. As we were leaving the museum for a late lunch, we were surprised to see the same Citroën in the lot we’d spied the day before over in Oklahoma City. We enjoyed good BLT and grilled cheese sandwiches at the Home Cookin’ Cafe in the rather rundown Ambassador Hotel on the east edge of town. 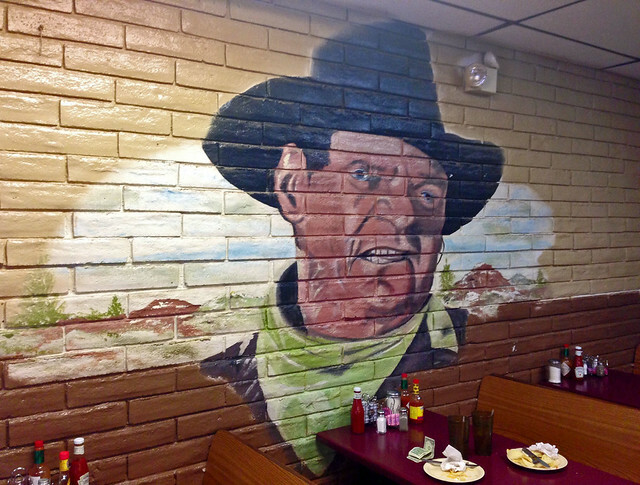 The Duke showed up as a wall mural above our booth; he looked okay from a distance, but was pretty scary up close. We scurried along to Amarillo, where we stayed at one of the Holiday Inn Express hotels. Dinner was at the adjacent and rather rowdy Texas Roadhouse, leaving me grateful for the quiet of the hotel room where I struggled to connect my new Canon Powershot SX280 HS with my iPad over the hotel WiFi. Later I would learn to just tell the camera to become a wireless access point for the iPad to connect to. We would spend the following day at an RV museum and Cadillac Ranch in Amarillo before heading west over 280 miles to downtown Albuquerque, New Mexico.